West Windsor, N.J.-- It was an evening of cheers and applauds as the MCCC PASS program (Program for Academic Services and Success) saluted its top students for their academic accomplishments on April 30. 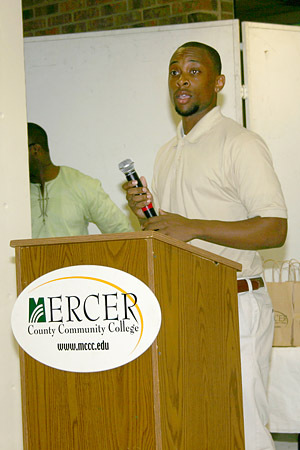 Graduating student Tajh Laster served as master of ceremonies for the celebratory banquet, which included a dinner buffet prepared and served by members of the MCCC Hospitality Club. Addressing the enthusiastic crowd of students and families, Dr. Donald Generals, vice president for academic affairs, noted that PASS students should take a moment to acknowledge their personal accomplishments. "Your hard work has gotten you where you are today. Adversity makes you stronger," he said. Also part of the program was Associate Professor and Counselor Maria Rodriguez. Among the students who participated was Estefania Castro, who will graduate this month with a degree in Education. "Mercer has been challenging and the professors are serious about teaching." she said. 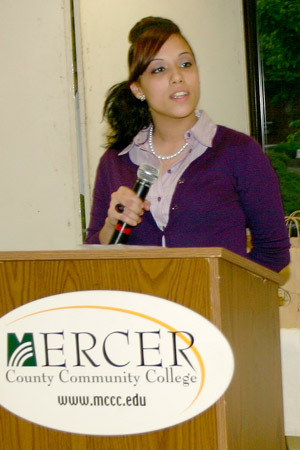 Pushing herself to excel while at Mercer, even taking summer classes, Castro discovered an oasis in the PASS program. "I could always find a place to study there, to work with tutors, and to see friends," she said. Liberal Arts major Ishiya Hayes also spoke. Starting at MCCC in 2008, she considered the choice before her. "I could either be someone who sits in the audience and watches other people get awards or I could get the awards myself." She chose the latter, Hayes told the crowd. Returning to campus for the event was alumnus James Walters, a 1990 graduate of the Criminal Justice Program who is a police detective in Hamilton Township. In his remarks, he emphasized the importance of the PASS program. "It reaches down, grasps you by the collar and pulls you up," he said. Initially lacking academic focus, Walters said PASS gave him the guidance and support he needed to achieve. 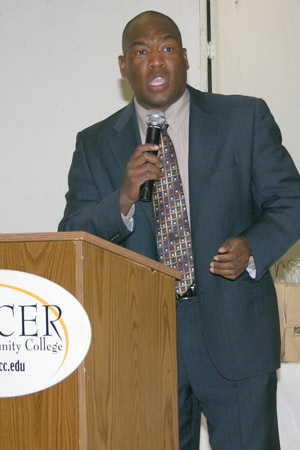 Walters continued his education after Mercer, earning his bachelor's degree from Rowan University and his master's degree from Seton Hall in 1998. "Continue to strive," he told current students. Embrace your college experience." 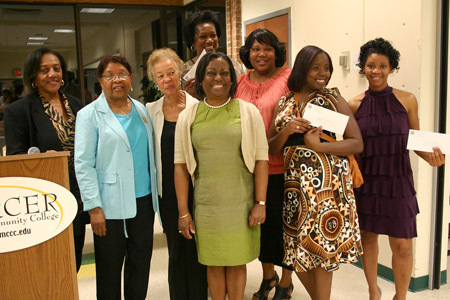 In a special presentation, the Central Jersey Network of Black Women, Inc., presented scholarships to five students: Stacy Bryant, Virginia Hinton, Melanie Livingston, Sherry Robinson and Barbara Simmons. 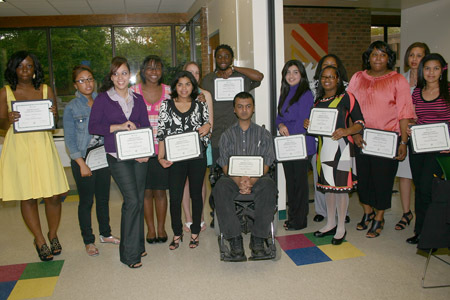 MCCC students who earned President's List honors in fall 2009 were Ashley S. Baker and Malvinkumar C. Gandhi. 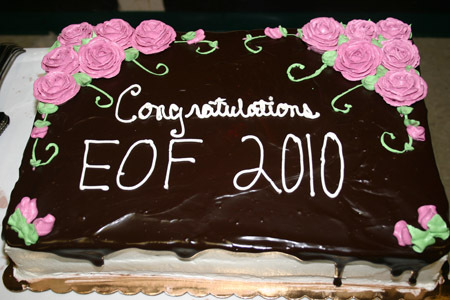 Dean's List students for the fall 2009 semester include: Hanan Agyapong, Crystal Brandt, Simone Bryant, Stacy A. Bryant, Jennifer Candelario, Estefania Castro, Javier Colon, Ian Conley, Judith Dabrows, Friasia Goldware, Ishiya Ashley Hayes, Sharon Herrera, Ariana Jones, Bushra Khan, Sikander Khan, Tiffani Mabry, Fozia Malik, Catherine Martinez, Tiffany Mason-Wells, Donovan McCleese, Dymonique McCleese, Tatiana Medina, Prince Nabi, Deborah Rhett, Shelly Robinson, Shanique Stoddard, Ansley Varela and Shamirah N. Williams. Under the direction of Dr. Khalida Haqq, PASS is a comprehensive retention program that nurtures student success. "Our vision is to open doors for students who are disadvantaged by low income and lack of access to quality public school education and to help them succeed," she said. Among PASS' services are individual and group counseling, financial aid assistance, peer tutoring, academic advisement, summer enrichment, leadership training, mentoring and transfer assistance. Estefania Castro shared her Mercer experience and her warm memories in PASS. Alumnus James Walters encouraged students to make the most of their college years. 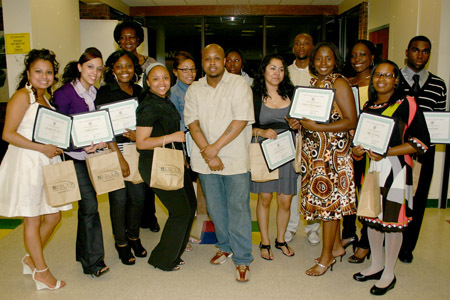 PASS 2010 graduates with Counselor Al-Lateef Farmer, center. Simmons (back), Stacy Bryant, Melanie Livingston and Virginia Hinton. Members of the MCCC Hospitality Club prepared and served a delicious buffet.